UPDATED: November 19, 2015, at 1:21 a.m. 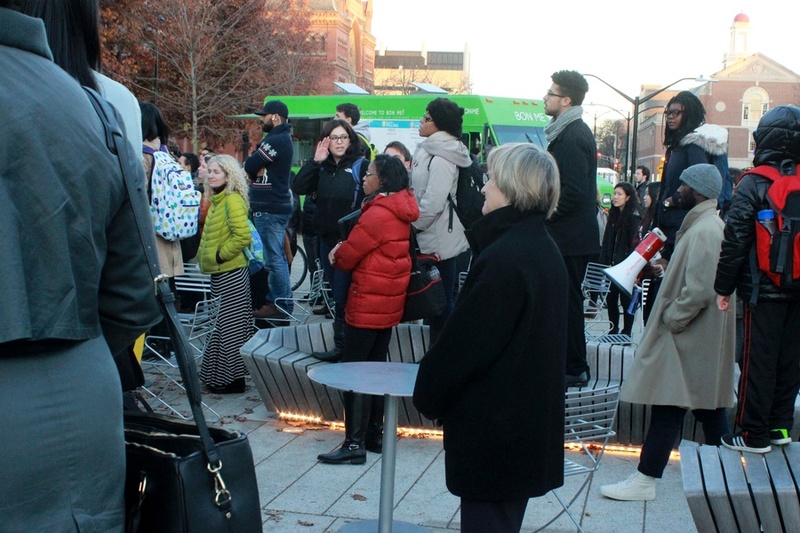 Dozens of students and Harvard affiliates gathered in the Science Center Plaza on Wednesday afternoon and marched to Porter Square to meet with demonstrators from Tufts to rally in support of black student activists on other college campuses, where mass protests against racism have erupted in recent weeks. 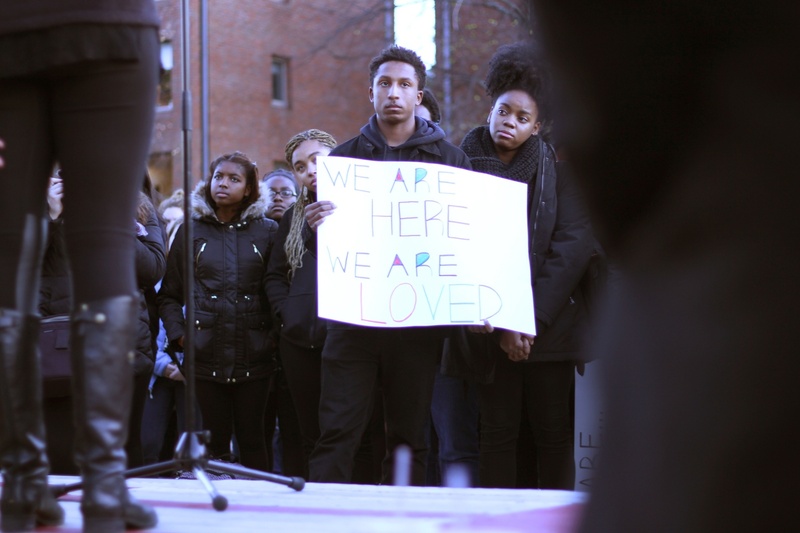 Beginning with a number of poems, songs, and spoken word performances at the Science Center Plaza rally, organizers called on fellow students to provide support for peers at other institutions like Yale and the University of Missouri at Columbia, where controversies have instigated debate about the experience of students of color there and how administrators have responded to allegations of racism. In Porter, the Harvard activists merged with a significantly larger group of protesters from Tufts. Several Tufts affiliates arrived carrying a banner that read “We are the Three,” a reference to data from the federal government that say only 3 percent of Tufts undergraduates are black. While the speakers from Harvard voiced largely the same themes in Porter Square as they did at the Science Center, activists from Tufts had sharper criticisms, reciting more pointed chants and reading a list of nine demands for their administration. Students from Harvard and Tufts listen to student leaders from both schools after marching to Porter Square. 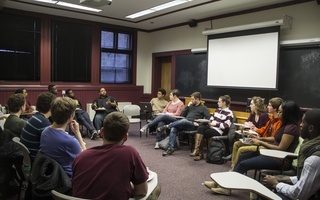 The event was part of a larger National Student Call to Action, encouraging colleges across the country to organize their own events to bring attention to the continuing problem of racial inequality on college campuses. 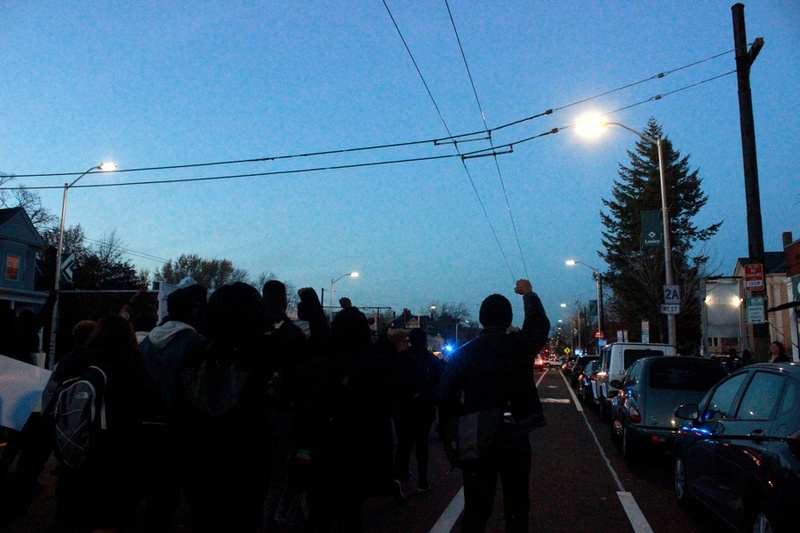 Among the demands were increases in black representation among undergraduates and faculty to 13 percent, increased funding for Tufts’s Africana Center, and an end to “racial profiling” that they claimed was perpetrated by the Tufts University Police Department. Robert Rush ’18, an organizer of the event, said Harvard organizers had no intention of making demands. 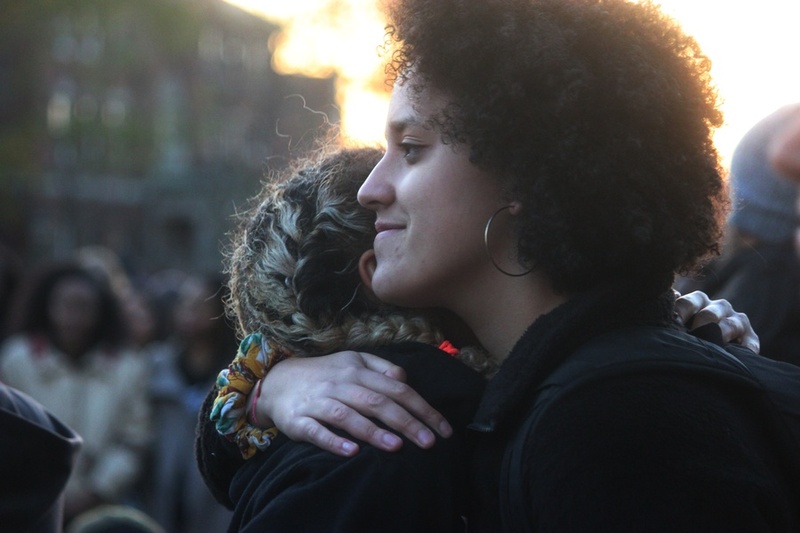 Event organizers praised Harvard administrators’ commitment to creating an inclusive environment. Hasani A. Hayden '19 holds up a banner during a rally at the Science Center in November. 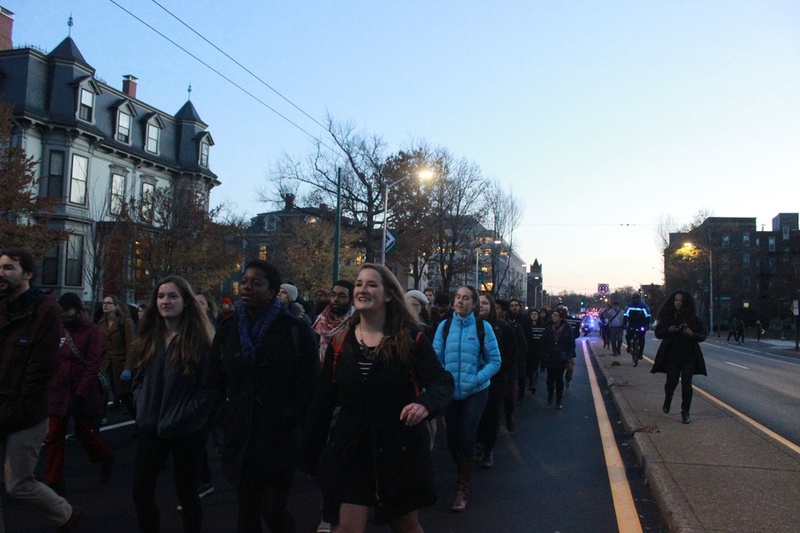 Students rallied and marched to Porter Square in support of black student activists at peer schools such as Yale and the University of Missouri. Earlier in the day, Jay M. Harris, the dean of undergraduate education, had told faculty members of the planned walk-out and march in an email, encouraging them to inform teaching fellows. Harvard attendees, by and large, appreciated the opportunity to connect with students at Tufts. 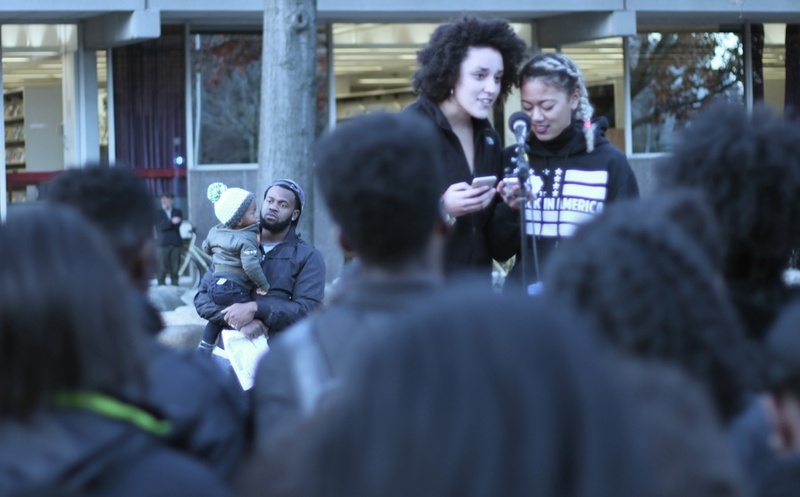 After the rally at Porter, some Harvard and Tufts students debriefed at an off-the-record event at the Student Organization Center at Hilles, an opportunity, organizers said, to put together plans for future activity. Across the country, allegations of racism at peer schools have prompted protests that have spanned days. At Yale, students have held a number of highly attended marches, prompted both by a student’s claim that a male student had said his fraternity’s Halloween party was for “white girls only,” and a separate email from Erika L. Christakis ’86, who oversees a residential college at Yale alongside her husband Nicholas. In an email to her college’s residents, Christakis—who is a former master of Harvard’s Pforzheimer House—challenged an earlier message from Yale administrators advising students not to wear culturally insensitive Halloween costumes, and some students responded with outrage. At Mizzou, students have also protested incidents involving racism and have criticized the response from the university’s officials. 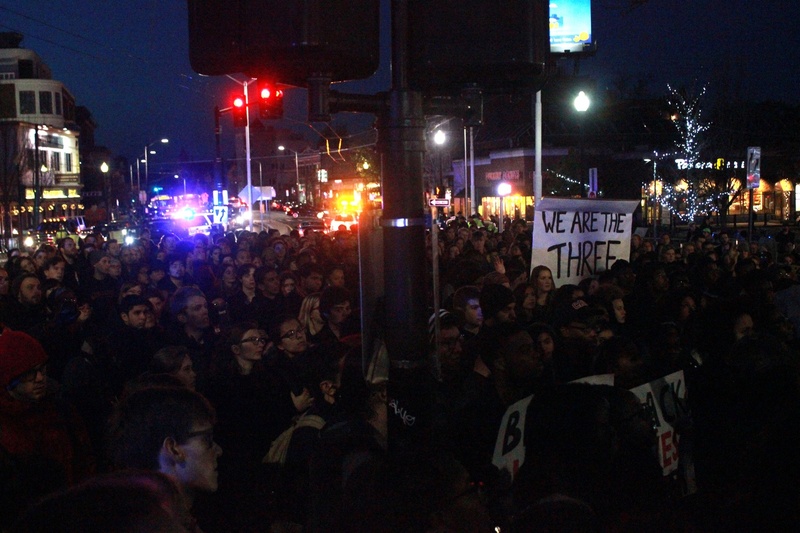 Timothy M. Wolfe, the Missouri system’s president, as well as Mizzou’s chancellor, said they would step down under pressure from protesters last week. A "pattern across the land" of ending Third World Studies Programs and decreasing black admissions will lead to "lily-white campuses,"
Waiving final examinations was one of four options the MBA faculty passed yesterday for students participating in the Afro-led strike. 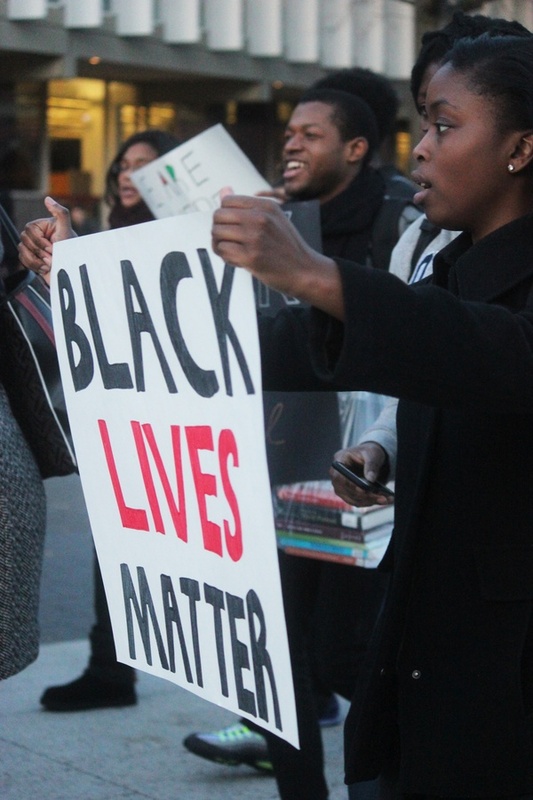 Each instance of racial tension must be treated in its own context.